To the extreme right can be seen a hut, with two men and some cattle ahead, possibly near a series of wells dug in a dry river bed. 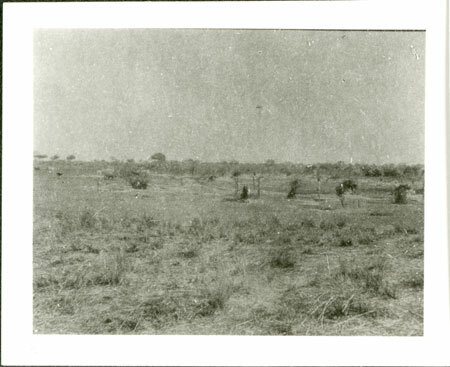 It is likely that this location is near the Sobat or Nyanding Rivers among the Nuer Lou, where Evans-Pritchard did the bulk of his fieldwork among the Nuer in 1931. Note on print reverse ms pencil - "4 132 "
Morton, Chris. "Nuerland scenery" Southern Sudan Project (in development). 03 Jan. 2006. Pitt Rivers Museum. <http://southernsudan.prm.ox.ac.uk/details/1998.346.132.2/>.